This is part of a 1000 acre green mosaic that covers the north west of Guildford. It is owned by Surrey County Council and managed by Surrey Wildlife Trust; it is a major wildlife reserve and amenity area. Previously the area was an integral part of the local community, providing grazing and foraging. This green area is a wildlife reserve and prime amenity space, in an area of encroaching housing, with high population density. Within a short distance of the common are 5 schools and numerous youth groups. A recent study showed approximately 25,000 people of school age living within 5 miles of the common. 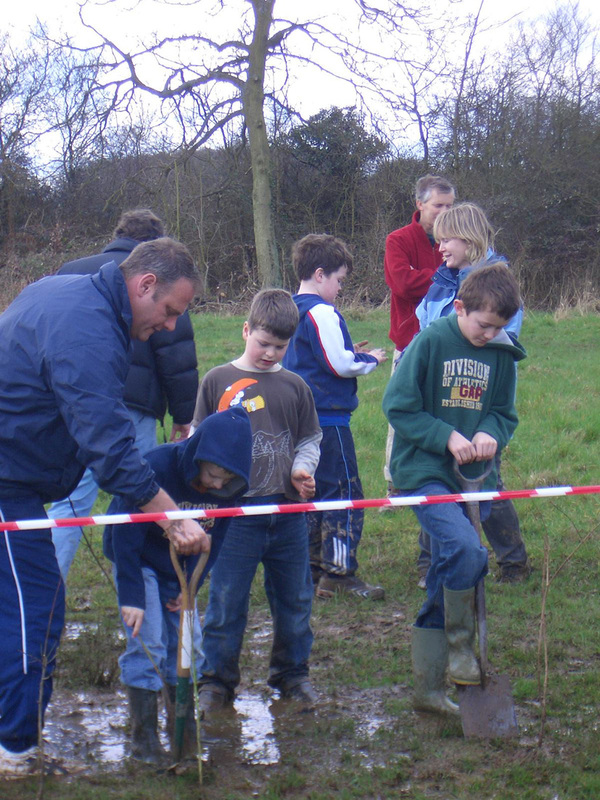 Recent planting of approximately 200 metres of mixed hedging was carried out by local Scout and Guide groups, with a little help from the parents. This hedgerow will act as a corridor for wildlife and improve local biodiversity by reintroducing native species that have been lost through disease and neglect. Everyone did some real work in between showers, and went home with a sense of a job well done; Surrey Wildlife Trust very efficiently organised tea, coffee and cakes and biscuits for the workers. The job was completed in one day.